When avid gamer James Young lost his arm, he became despondent, but, thanks to Konami, he has now been outfitted inspired by the game Metal Gear Solid and boasting a dazzling array of futuristic features. 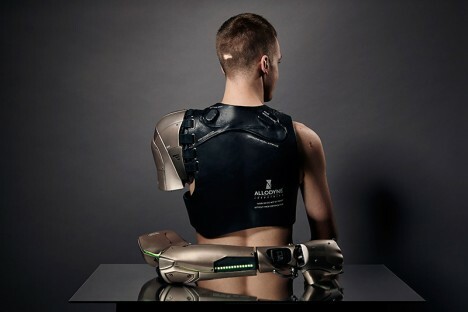 This arm project was led by prosthetic artist Sophie De Oliveria Brata, founder of the Alternative Limb Project. Another prosthetics company named Open Bionics took care of 3D-printing the hand. 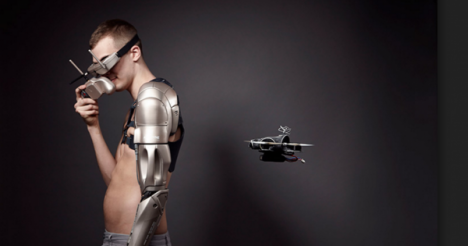 Costing around $100,00 the carbon-fiber replacement limb moves in response to muscle signals, allowing him to lift and carry objects but also employ its screen, flashlight, USB phone-charging port and (best of all) deploy a battery-powered drone attached to its side. The prosthesis weighs about ten pounds and is supported by a harness strapped to his body. See more in Cybernetics or under Technology. April, 2016.